Stolen fruit tastes sweet, forbidden fruit tastes sweeter. Indeed. 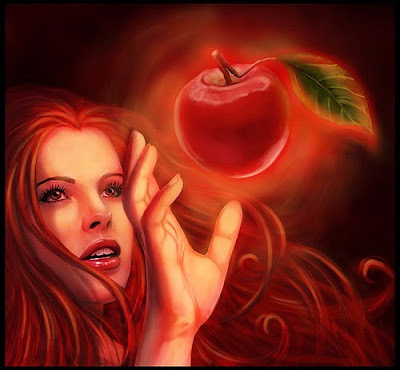 The forbidden fruit, from the tree of knowledge, from the garden of Eden, the one which Adam and Eve ate and lost their innocence, is surely one hell of a fruit. Usually denoted by an apple this phrase can denote anything that you know you cant have. When you have all the things you need, but not the thing you desire, you desire it more. There is always a kick in wanting something you know you can never have. As they say, the grass is always greener on the other side. You might have all what you want but we could always do with something better. Its funny yet interesting. The very fact of knowing that you cant have something makes you want it even more. Its only a short lived high though. The forbidden fruit tastes sweet only until you don't have it. Once you get it its no longer sweet. That's because it is no longer forbidden. Just the word forbidden can make such a huge difference. Its almost like the forbidden thing has a note in flashing colors that says, 'Catch me if you can'. The things that you cant get are always considered the best. That's the reason why in 'Twilight' Edward Cullen falls so desperately in love with Bella very well knowing that a vampire can never have a normal human girl. Then came the most famous dialogues, 'And so the lion falls in love with in the lamb'. So true eh. If you cant have the forbidden fruit then its always a clear case of the sour grapes. Cant have the grapes, so the grapes have to be sour. Damn. Guys find it a big turn on when some girl doesn't want to go out with them. If the guy is a bit good looking then the desperation becomes worse. Well same thing applies to girls as well. When you can have all what you want, but there is one thing that cant be yours then all you want is that. 24 x 7 that thing keeps flashing in your mind. All you want to do is go grab it, but you can never get there. Yet, the forbidden fruit keeps you wanting it. Well human tendency, what else can you say. That's how the norm is and its always gonna be the same. Interesting insights about human behaviour. oooh baby tell me about it... Im sooo wanting this totally restricted fruit right now.! !